This time last week I was reaching my final destination in London, ahead of Tuesday's London Book Fair, my first visit as either an author or member of the public. 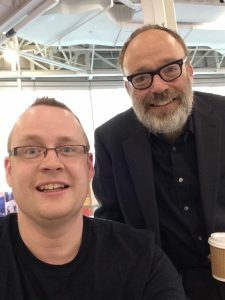 As well as sum up my experience, I wanted to give a flavour of how the book fair is from an author's perspective, plus give a shout out to the many authors with whom I met and swapped details. That last part, for me, was the highlight of the conference, and the value of being there in the first place. I'll come back to that––and a pigeon––later. At times, and if walking around the whole arena (and it is vast! ), it can make you question whether an author has any role in such an event––as absurd as that thought sounds. Rest assured, if you are an author, once you've navigated your way right past everything else, there is an oasis waiting for you, with like-minded sounds (and dare I say) the best spot to hang out and chat in the whole place. I am talking about Author HQ and the surrounding zones. Most days I set up camp in the ALLi stand (I'm a new member, but soon found myself answering questions, moving boxes and handing out material!). Only occasionally did what was said (by the traditional publishing industry speakers, no less) from the front leave listeners annoyed and confused (search #LBF18 on Twitter for these examples)! I attended the conference as a current member of the SPF Mastery group (Mark Dawson‘s spearhead marketing program) as well as becoming a member of ALLi (Alliance of Independent Authors). These two groups (with a lot of overlap, as I was to discover) formed my mainstay for the conference. Many new friends made! I was able to have a coffee with Mark himself, and got to join James Blatch (and John, but not Dyer, the other John) for dinner one evening. They were all such friendly, down-to-earth people, offering their time and space to anyone who was asking––and there were lots asking. I'm sure they are all thorough exhausted after last week. It was a pleasure to get to chat with them. It felt like they already knew me a little (which as one of no doubt countless students on their course is still unique!). 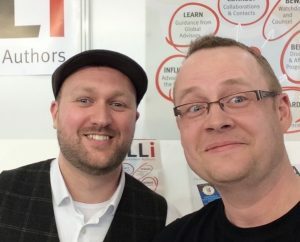 Hanging out on the ALLi stand (for many reasons an excellent place to be, not to mention the fact there were seats available there––again, LBF, why not provide MUCH more seating in future, for people to chat? ), I also got to meet Joanna Penn. As a listener to the SPF Podcast each week, I've come across here often, but have never been in the same room with her before. It was fun to discover that my fantasy series (and her reader's group) share the same name! 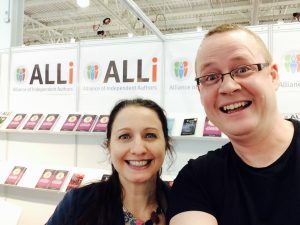 As an ALLi member, you are also allowed to put a copy of your book on the shelves (as shown behind Joanna in this picture). My latest book (The Machine) can just about be seen coming out the side of Joanna's neck on the bottom shelf. I also got to meet in person for the first time with James P Sumner. In the past, we've both reached out to the other for help––and years later, we are both full-time, multiple books, and members of both Mark's course, and ALLi. This was the first selfie I took––thankfully, with the other two, I remembered NOT to look at the screen instead of the camera. D'oh. Rein Raud (I was listening to this Estonian speaking at a seminar, and realised we've been chatting on Goodreads about an author meetup in Tallinn but had never met––until last week in London!). As well as Philip Lynch (ALLi), Laurence O'Bryan (BooksGoSocial), and Nick Singh (Ingram Spark). Janet Pywell, AA Abbott, Wendy Jones, Margaret Skea, Orna Ross…and many more which, at time of writing, my still tired brain has failed to recall your name. 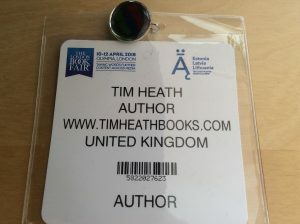 I went to LBF wondering if some television executive was going to want to sign me up…still dreaming…but the value of such an event is the networking element. It's the conversations over a coffee (or a beer) that fuel these events, not what might be said from the front of the stage. Of course, for many just starting out, what did get said was very helpful, but for me, an established author albeit still longing for a more significant breakthrough, it was the connections that will live long in the memory. Now I mentioned a pigeon. I presume it was in the building the whole time, but over the last couple of days, it made its appearance regularly in the author zone (a bird with writing ambitions?). Yes, it was a bird flying over your head. A famous author I might not be (nor does fame appeal), though successful I long for much more. 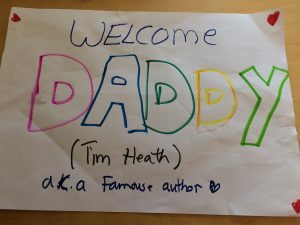 Maybe a few of the passengers into Tallinn on Friday have now heard of me (my daughters are two cute advocates!). Time will tell what comes from my five days in London. Will I be back? Probably…and if I am, you'll find me permanently camped around the Author zone, apparently handing out literature on the ALLi stand, as before.